The 2017 season was the Baltimore Ravens’ 22nd season in the National Football League and the 10th under head coach John Harbaugh. 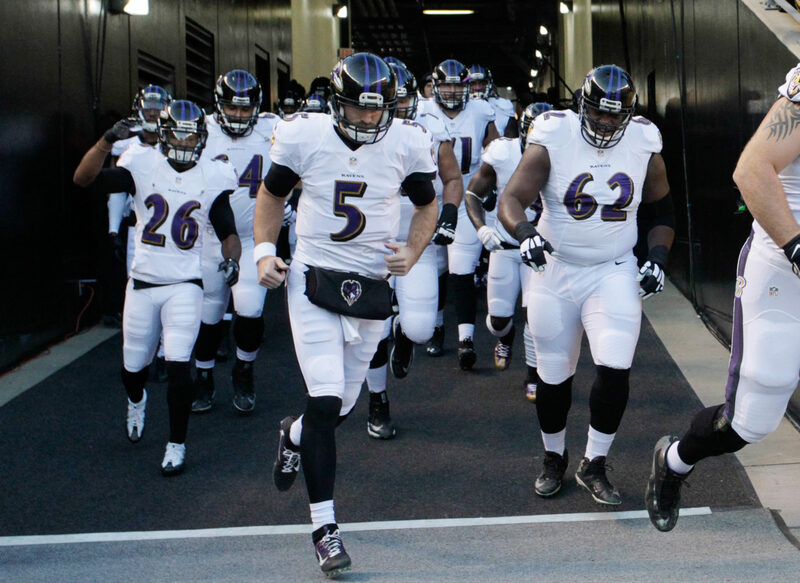 This was also the 10th season with Joe Flacco as the team’s starting quarterback. The Ravens improved on the previous season’s 8–8 record, but failed to qualify for the playoffs for the third consecutive season by a last second touchdown in a 31–27 loss to the Bengals in Week 17. It would seem that the shine has come off QB Joe Flacco in spite of his post-season success in the earlier part of this decade, leading the Ravens to draft Lamar Jackson in the 1st round as his heir apparent. Flacco’s regular season play has never been anything spectacular, however opposed to earlier in his career he has not had the benefit of a strong ground game or WR corps. This seemed to change to an extent as the Ravens were able to turn Alex Collins into a viable NFL RB. Led by 2nd team All Pro CJ Mosley, the defense also finished 6th in points allowed. With a rebuilt WR corps and an improving defense, the Ravens look to return to playoff contention in 2018. The focus here was to rebuild the WR corps. Jeremy Maclin clearly had lost a step last year and was released in the off-season. Veteran Mike Wallace was as well. as he was also not able to consistently deliver in the passing game. When healthy, John Brown had been one of the better deep threats in the NFL and could provide a boon to Joe Flacco. Michael Crabtree is a veteran WR whom provided he keeps his head on straight should be a reliable target. Willie Snead had an impressive 2016, but due to a DUI arrest in 2017 and subsequent suspension, he fell out of favor in New Orleans. They decided not to match the Ravens RFA offer and Snead left for Baltimore. This rebuild could be somewhat of a gamble with injury/personality concerns, but the Ravens on paper upgraded their talent at the position. GM Ozzie Newsome has been one of the best at drafting in the NFL for a long time, and this class looks like it could be another strong collection of picks. Again the theme here is focusing on the passing attack. Hayden Hurst should provide Joe Flacco with a solid receiving option from day 1 forward. With an eye towards the future, the Ravens traded back into the 1st round to pick up QB Lamar Jackson. This pick could prove to work well in the short term igniting motivation in Flacco, and work well to serve into the future should Jackson pan out. Beyond the top of the draft, the rest of the draft will be tasked with providing depth throughout the roster. WR Jaleel Scott could be a sneaky good pick at WR should one of the FA signings falter. This draft was lauded by most draft analysts as a solid effort. If Lamar Jackson ends up being the “QB of the future”, it will certainly live up to those grades it received. While there is certainly some injury concerns with FA WR John Brown – and character concerns with WRs Michael Crabtree and Willie Snead, on paper the Ravens should have upgraded their WR corps from last year’s group. The pressure is starting to mount on HC John Harbaugh, who has missed the playoffs now 3 years in a row. Granted, it took a a miraculous play by the Bengals in the waning seconds of their week 17 matchup to officially eliminate the Ravens from playoff contention last year, but I doubt the organization wants it to come down to the wire again this year. The big takeaway though is that it would seem the Ravens defense is once again on the rise, and they for sure have found a viable NFL RB in Alex Collins. On paper, the weapons for Joe Flacco have been upgraded so it is now on him to keep Lamar Jackson on the bench and play more consistently. Clearly the organization believes it can contend for the AFC North title. If they can capture that and put Flacco in a position again to have a deep playoff run, it would go a long way to securing Harbaugh’s long term job security as well as Flacco’s. With what should be an improved roster from last year, I believe the Ravens should be able to contend with Pittsburgh for the AFC North title. This is of course hinged on Alex Collins continuing to play well, the WR corps coming together and the defense once again being inside the top 10 in scoring. Flacco has always been a different beast in the playoffs, and he would be able to secure him and his HC’s job security by once again delivering on another deep playoff run. Email * NOTE: I need a real email here that you can check or you will not get a league invite.